*Festive Season Alert: Makes a good, inexpensive gift! If you’ve been following my latest exploits with digital music, you’ll have noticed I’ve dipped a toe back into LP playback after an absence of many years, make that decades. I was an early adopter of CD’s. Yeah, I know, a lot of the early ones sounded lousy, and to this day many current releases leave a lot to be desired. But in 1984 I was so sick of poor quality LP pressings that I jumped ship. Does anyone my age recall the Simon and Garfunkel LP where every copy from a certain set of stampers had a skip in the song The Only Living Boy In New York? Or the Crosby, Stills and Nash album CSN, where one channel through a whole side was distorted? So, you LP-loving digiphobes, please don’t gasp and write me off completely when you see the picture of my old turntable below. Hey, at least I didn’t throw it out. It still runs and with a new Audio-Technica cartridge I paid 50 bucks for, doesn’t sound too bad. The last time I bought a turntable was over 40 years ago! But that’s about to change, I have a new one on order. Though it’s not due for a month or more, I’ve already purchased the 2-disc, 45 RPM remaster of Kind of Blue. The loan of another ‘table, courtesy of Being There Audio in Orangeville, Ontario, has been kindly offered. But back to the Audioquest Anti-Static Record Brush. The problem with rubbing any two things against each other is the potential creation of static electricity (cue the standard quip from an English gentleman I used to work with: “Said the bishop to the actress”). 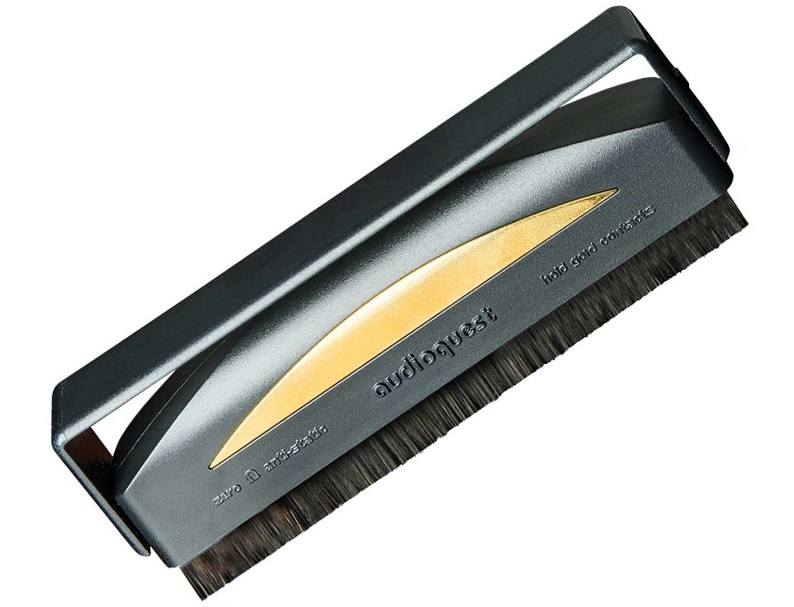 The touted advantage of the AQ brush is that the carbon fibers on the brush are connected to the gold-plated strips on the sides. Any potential static charge is dissipated through a conductive organism (you). The instructions that came with the brush were a bit vague when it came to the ideal method. 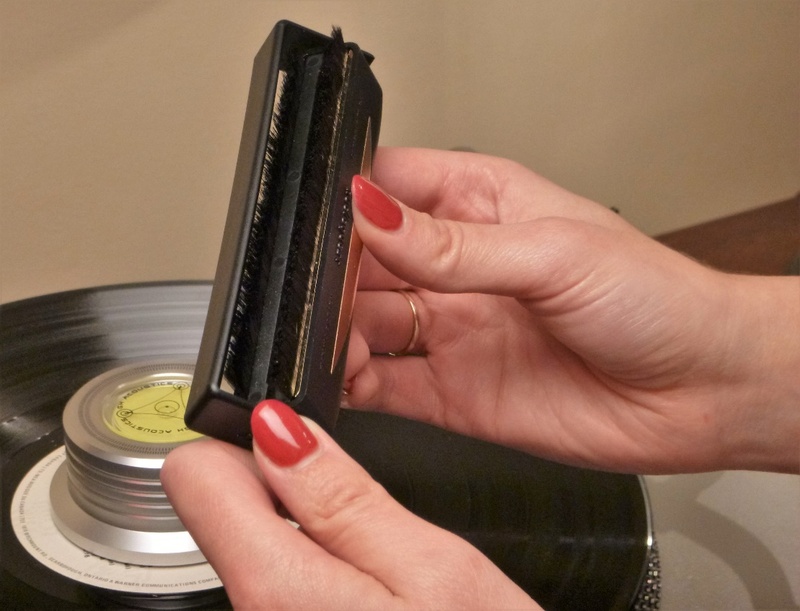 They did say to be sure and grip the brush by the gold-plated inserts, and don’t press down too hard on the surface of the record. 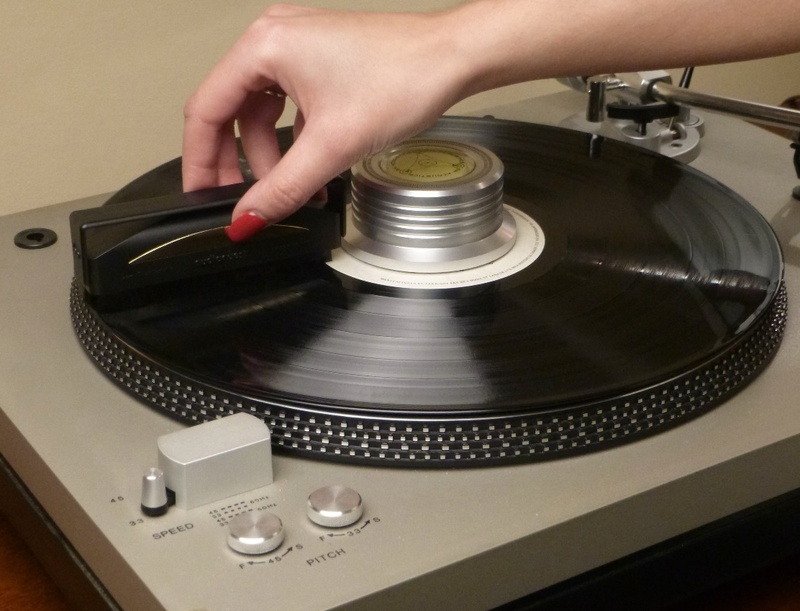 At any rate, my method is to put a record on the turntable, put the record weight on the spindle and start the platter spinning. Then, grasping the brush by the gold-plated contacts, I press the carbon fiber bristles lightly on the surface of the spinning LP. To clean the brush, flip the little guard back and forth a few times. Don’t touch the bristles with your fingers as you might contaminate them with oil from your skin. The brush seems to work fairly well, for surface debris. If you have ground-in dirt and grime, your records will likely need one of the wet systems to clean them. If you are as rich as Croesus or at least as rich as Michael Fremer, then one of the mega-buck ultrasonic cleaning machines might be called for. Sorry Mikey, just kidding. But here’s the killer app that I find really helps minimize the attraction of new particles. 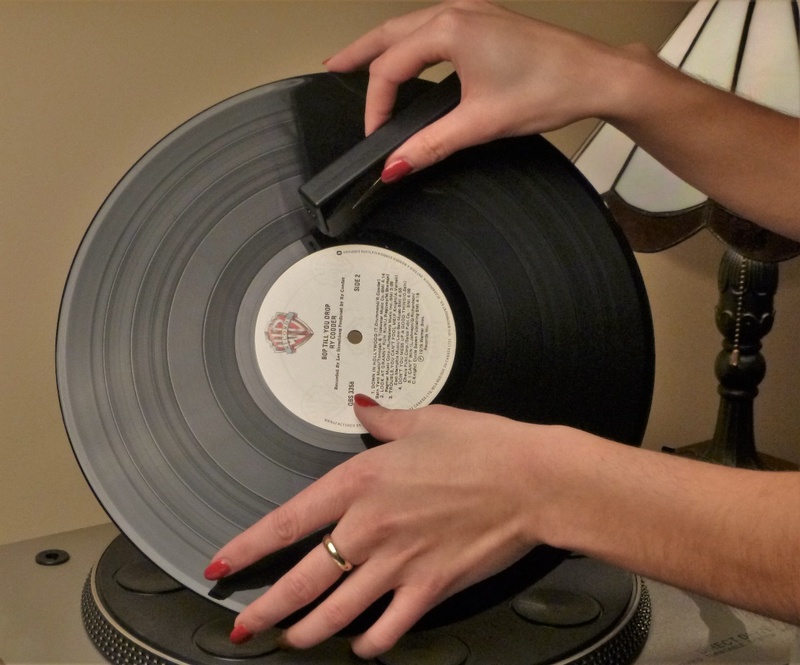 On my old TT I can hear the snap, crackle and pop of static electricity when a record is removed the from the platter. 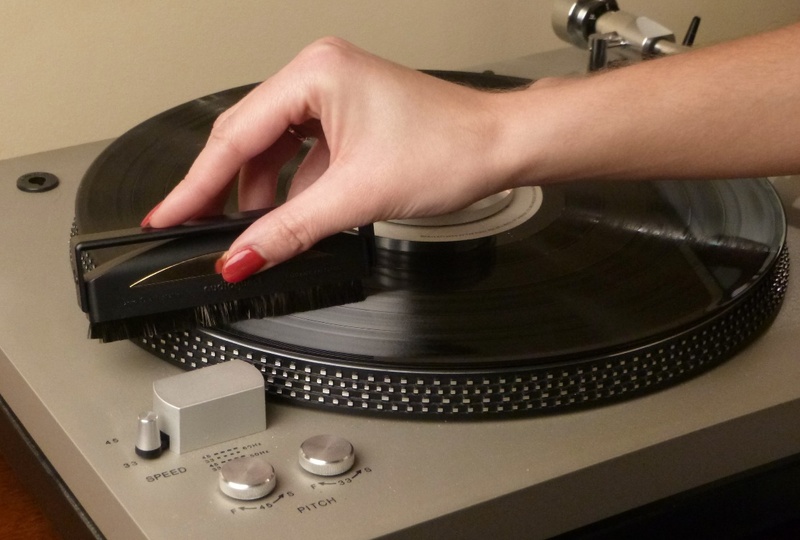 So, here’s what I do: With the record still on the turntable I hold the brush against it as I slide it up off of the spindle and clear of the platter (see picture below). It’s a bit of a juggling act as I have to hold on to the record with one hand as I put the brush down and either flip the record over or put it back in the sleeve. But no more new junk on my records! Would I buy it as gift for a record lover? Many thanks to my adorable hand model, the lovely Miss K.